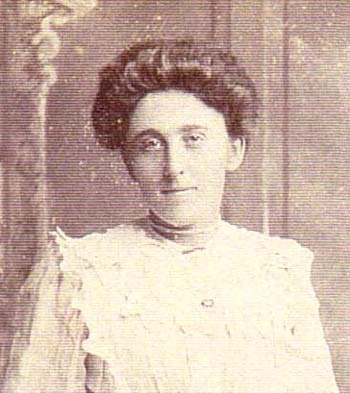 Laura Sackett, daughter of Jabez Sackett and Sarah Anne "Annie" Young, was born in Beverley, YorkshireG, on 26 October 1882.1 She died aged 84 at Rue Maze, St Martin's, GuernseyG, on 23 November 1966.2 She married on 16 April 1906, Thomas John Keyho, son of John Keyho and Elizabeth Roberge De Garis. GRO Indexes to Births, 1837 to date, "Dec qtr 1882. Sackett, Laura. Mother: Young. Beverley. 9d:115." Register of Deaths, Guernsey (Guernsey Greffe, Royal Court House), 135/505, "23 November 1966, Laura Sackett, widow of Thomas John Keyho, 84, father Jabez Sackett, mother Sarah Annie Young, d. at Rue Maze, St Martin's, usual abode Longue Rue House, Les Caches, St Martin's, b. Beverley, Yorks." Laura Sackett, dau, 8, scholar, b. Walkington. Le Page, Mary Amelia, boarder, 24, single, servant (domestic), b. St Peter Port, father b. St Peter Port.